Title: Essex County Penitentiary, New Wing Corridor. North Caldwell, New Jersey. 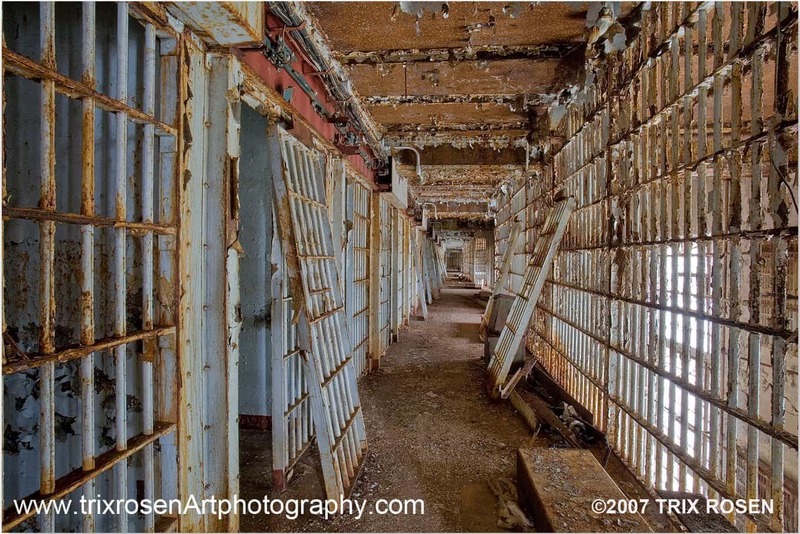 As both a historic-preservation and fine-art photographer, I am drawn to the timeless nature of a historic site; it is a repository of collective memories like those etched and concealed within the interior walls of this rusting prison ruin. It was a cold December day in 2007 when I first walked through the Essex County Penitentiary. My assignment was to photograph the 32-acre jail complex as part of a required HABS (Historic American Buildings Survey) documentation before the institutional structures and outbuildings, built between 1872 and 1929, could be demolished to make way for luxury condominiums. Photographing the “New Wing Corridor” was not part of the job, but the gritty prison hallway pulled me into an evocative still life of decaying iron bars and unhinged doors that allowed the silent voices of those once incarcerated to escape. One of my favorite photos you have taken in recent years. I love the colors and grittiness. Beautifully captured.